Styrax are trees and shrubs belonging mostly to warm countries; a few of the hardier kinds succeed fairly well with us in light moist soils. They are summer-leafing, of neat habit, and with abundant flowers like little white bells depending from the underside of the branches. The commonest and best kind is S. japonicum, but there are others worth growing though seldom planted. Increase by layers, seed, and cuttings of the soft wood in heat, or of partially ripened shoots under a handlight in the open air, later in summer. Peat is not necessary for these plants where the natural soil is good and free, but heavy soils are against them and they dislike chalk and much lime. Styrax Americanum - A shrub of 6 to 8 feet, grows in wet places in S. Carolina and Virginia, with nodding white flowers from April into June. S. californicum, a shrub of 5 to 8 feet from the mountains of California, bears larger flowers, but is tender with us. Styrax Grandifolium - A pretty shrub of 8 to 10 feet high, and the best of the American kinds for this country. To do well it needs a warm and rather dry place, even in our southern gardens, to ripen the shoots in autumn, without which the flowers are scanty and the plant liable to injury. The leaves are 3 to 6 inches long, tapering to a point and hairy on the underside, and freely bears during early summer fragrant white flowers. Mountains of Georgia and Carolina. Styrax Hemsleyanum - A summer-leafing small tree, native of China, of recent introduction, and growing well in Cornwall, and worth trying farther north. Best in warm spots and on free soil. Flowers white. Styrax Japonicum - The most useful and handsome of the group, hardy almost anywhere in the south, but tender in the Midlands unless grown upon a sheltered wall and protected in sharp weather. The habit of the plant is characteristic, the branches spreading flatly into slender much-branched shoots, covered with ovate glossy leaves and myriads of little white bells dangling clear of the leaves upon their long stems, which spring from the underside of the branches. In Japan it is a tree 40 feet high, but so far we have none approaching this height. Another Japanese kind, S. serrulatum, comes very near this, but is less hardy. There is a pretty form of S. japonicum in which the buds are flushed with rose color. 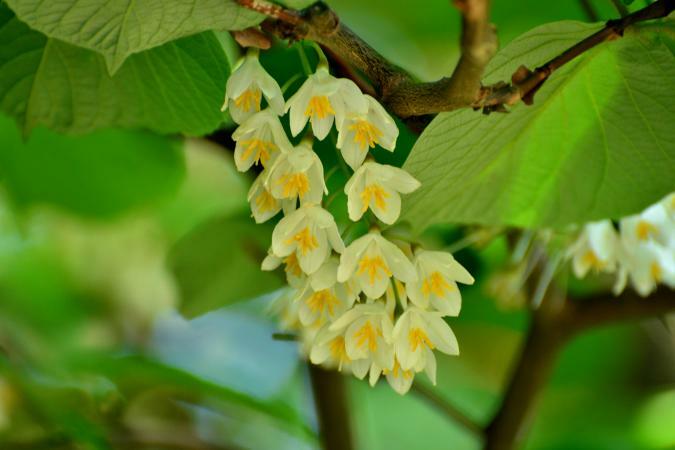 Styrax Obassia - A Japanese plant with large broadly-oval leaves sometimes 8 inches across, and racemes of fragrant white flowers like a Snowdrop, and opening a little earlier than in S. japonicum. Two fine plants have grown for years without injury at Coombe Wood. In Japan it is 30 feet high, with bold leaf effect even when out of flower. Styrax Officinale - A shrub from the Mediterranean, 12 to 15 feet high, with sweet flowers like the Orange, opening as little clusters in May or June. It needs the same care as S. japonicum, flowering and fruiting freely against a sheltered wall.